Last night Kyle, Eryn, and I went to see The 36th Chamber of Shaolin at the Trylon as part of their Shaw Brothers series. I asked them to do a Shaw Brother series back when they were looking for showing input, but I think this is entirely attributable to one of the staff who's a fan. Eryn and I went to Northbound Smokehouse and Brewpub for dinner first. She'd never been there and her opinion is the wing skin is a little more jerky-like. Which I prefer. But she does not. So Buster's is still her optimal hang out in that area. I told her next time we should try the Howe. The movie was great. 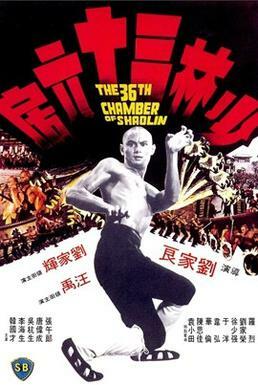 I hadn't watched this particular one, although I've seen a lot of Shaw Brothers via Netflix. It had a bit of a Game of Death feel to it with "levels" and Game of Death predates it by 6 years (1972 versus 1978), so maybe there's some pollination. However, unlike Game of Death, the main character San Te isn't fighting enemies as he advances, he's learning specific Shaolin fighting skills and toughing up parts of his body. Every time he makes use of his tougher noggin skills in actual combat the film focuses in on it, sometimes even in bit of slow mo, so you realize he's using something he learned. Kyle called it the longest training montage ever in a movie, and that's a good summary. 80% training montage followed by 15% showing students the benefits of his training montage, followed by 5% using his training to defeat some bad people (although leaving the killing up to his students, one who wants to hack a guy with a sword 1000 times, but sort of wears out after a dozen).